Karla Fung, social media manager at Runyon Saltzman Einhorn. Photo: Kevin Fiscus. She’s 31, grew up in Concord, graduated from the University of California, Davis, lives in Hollywood Park where she has served on her neighborhood association for the past four years, serves on the Pacific Rim Street Festival planning committee, and works as the social media manager at Runyon Saltzman Einhorn. Her career has taken her from working on a on Measures Q & R campaign where she “got to know the political scene right out of college” to serving as the social media voice for numerous brands and projects in her current position. We met at Nido in December to talk about the city of Sacramento, media consumption and her thoughts on the news. Karla moved to Sacramento in 2006 before the city “started coming into it’s own” and put down roots in 2011 when she and her husband purchased their home. 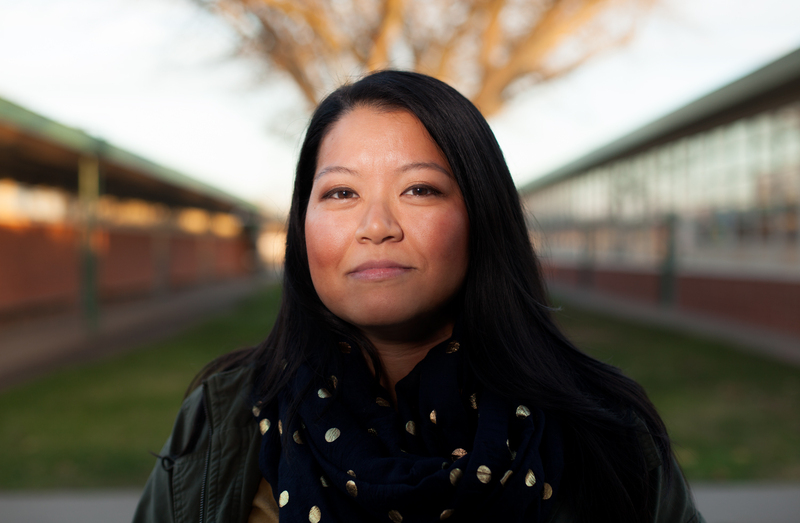 “People often diss on Sacramento because it’s smaller but I think it’s a benefit,” she says. Infill, she says, has changed the landscape and added entertainment density to the central city. She’s curious to see how Crocker Village, McKinley Village and development at the downtown railyards will interact with existing neighborhoods. As an early adopter to social media, she’s appreciates how her network crowdsources alternative perspectives but wonders if she follows too many people and worries she is not as connected as she used to be. During our conversation, we talked about how an abundance of good content can be intimidating. You put off reading the best stories until an ideal set of conditions are met, but don’t set aside time to meet those conditions and end up with a growing reading list. You may want a comfy seat with a hot drink in a quiet house, but without those things, you avoid reading the stuff you think you should be reading. For Karla, this perfection procrastination paralysis manifests in stacks of magazines at home. If this feels familiar, you might have it in Twitters likes, Facebook saves, unplayed podcasts or a full DVR. Still, you’ll often find her at Nido on weekends, where the owner knows her name, with a coffee and a local newspaper or city magazine. “There’s something amazing and great about reading something in your hands,” she says. Karla answered the following questions by email about how she gets the news. Text submitted December 10. A variety of places – Twitter and Reddit for national or global news; local I get through breaking news email alerts when I’m at work. Neighborhood news through our Facebook group or Nextdoor (and that’s another can of worms right there). And yes, every now and then I like to crack open the newspaper and read it (when I have the leisure of time to do so). When I’m in the car, I listen to Capital Public Radio and will often just stay seated in the car to finish a story. It’s a tossup between the Baby Jessica story or the Loma Prieta earthquake in 1989. While technically the Baby Jessica story took place earlier, I can’t recall if I remember the actual broadcast news or the movie. This is a tough one since I don’t subscribe to anything local (sorry!). But I do get all local pubs through work so I have all of those at my fingertips. Otherwise the only other media I get at home are magazines like Sunset and Food & Wine. This question is even harder since there are so many great things to eat in this city (and trust, I eat them a lot. My bank account should just be tied to all Magpie properties.). If I had to pick just one thing in Sacramento, I would say it would be the poke at Fish Face Poke Bar. After my kid was born, all I wanted to do was eat raw fish so thank goodness the opening of Fish Face happened right before that. Outside of the Sacramento food scene, it would have be a Lao style bowl of sukiyaki I had on Thanksgiving at my best friend’s house. This is a loaded question. There is a lot that is wrong with the news or what is even deemed “news”. I do tend to gravitate towards the New York Times. I’ll leave it at that. (1) Brand recognition — As a Bay Area transplant, I’ve had to spend the last 10+ years trying to convince my friends that yes, Sacramento has a lot going on and it’s amazing. Don’t dismiss it just because you “drive through it to get to Tahoe” (which for the record, takes y’all a lot longer to get there from the Bay Area than here! So ha!) or because you don’t think we have enough sports in town. Once people come to visit and see how EASY Sacramento is – less traffic, easy parking, lots of great bars and restaurants – they change their tune. For the record, that was my write-in tagline for the Sacramento branding campaign – Sacramento: It’s Easy. (2) Flooding — When I lived downtown on the 11th floor, I used to joke with friends that should there be a flood disaster to come over because we would be high and dry (plus I always have a stocked pantry). Now that I don’t live 11 stories up, I think about it a lot especially when we are anticipating some serious rain in the El Niño year. In the last few years of living in Hollywood Park, I’ve seen some streets get super flooded because of clogged drains and the whatnot. (3) Food security — A few years ago, I worked on a campaign for Foodlink and learned more about the food needs of our greater community. There was a great piece on Capital Public Radio about food security that resulted in me sitting my driveway until the program was over. Where do I start? I love news. I love knowing what’s going on. However, I often get angry about what is deemed as “news.” Sure, there plenty of people who want to know the latest celeb gossip but that is what it is. Gossip. Keep it out of the news please. I hate the increasing amount of clickbait that happens with one-liners that are supposed to entice you to click on the story. This is increasing locally, which I find sad. The last thing that I hate about the news is the 24-hour news cycle. It has diluted news content and has created some very questionable “news” personalities. If I could be anywhere an hour-and-a-half away, I would be in a national forest like Eldorado National Forest or Stanislaus National Forest and be disconnected from everything. Follow Karla (@karlafung) on Twitter and connect with her on LinkedIn.